RESERVE YOUR "PERSONALIZED" BLACK & ORANGE POPS NOW! Supplies are limited and going fast. 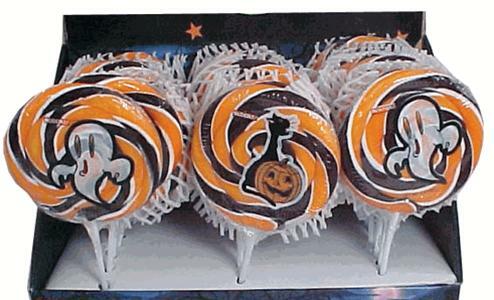 Place your order for our black and orange swirl lollipops now to ship at Halloween! How yummy are these? So colorful, so festive, so scrumptious. . .so big. Personalized jumbo Whirly pops and Orange & Black Swirl Lollipops are a fun treat for your guests. Our personalized lollipop favors are available in an array of designs and we are sure you will find one to reflect your personal style. A fun, inexpensive and unique Halloween Party favor. A perfectly sweet ending to a perfect day. 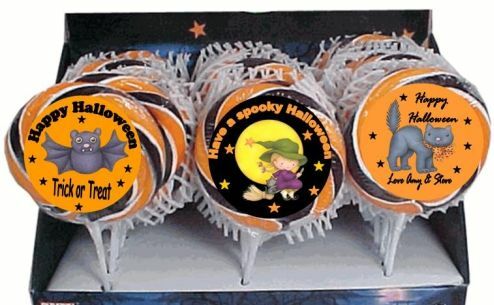 Our Personalized Halloween Whirly Pop and Swirl Lollipops can be ordered with a front label only or a label on the front and back. Our personalized Halloween Lollipops come finished off with festive curling ribbon or an elegant bow at no extra charge.